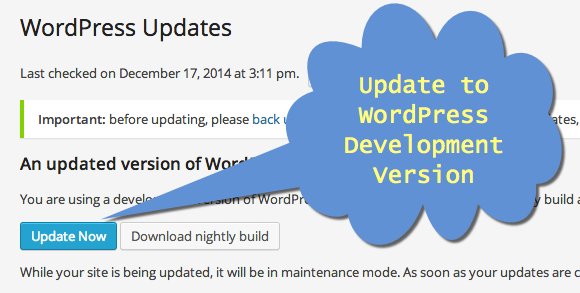 How to Install WordPress Alpha, Beta and Nightly Build Versions? Before a new version is released for public, WordPress follows a lengthy process for testing and fixing the bugs. Generally the versions are named as alpha, beta, release candidate and then the final stable public version. What you can upload from wordpress.org site or from any hosting companies is the latest public released version. If you have customized site with lot of plugins, custom fields and modified theme files then it is a good idea to test the compatibility of your entire site with the test version of WordPress. This will avoid you to take precautions before something goes wrong with public version of WordPress suddenly when it is installed. How to know the release cycle and the latest version? How to install and test it on your blog? How to report bugs if you find anything? This article attempts to explain all those questions. Before starting, it is very important that you install development version on your test site and NOT on the live site. The structure of the database will be changed when you install the development version and it is not possible or not advised to revert back to public version due to stability. As the name indicated, development version is not expected to be stable hence you may feel some functionalities are not working properly. The latest public release version of WordPress is updated in wordpress.org site under blog section. Click here to go to the release section to check out the release status of the latest stable WordPress version. You can find the updates on the WordPress core site or register as a tester to get updates on beta version. Check Alpha / Beta forum for the latest Alpha and Beta version updates. How to Install WordPress Development Version? Download the latest nightly build development version from wordpress.org site or use WordPress Beta Tester plugin to install the latest development version on your testing site. Activate the plugin once installed and navigate to “Tools > Beta Testing”. Point release nightlies – this option allows you to update the point version like x.x.x. Bleeding edge nightlies – this option will update the latest development version which will be updated every night. This will be more unstable compared to the previous option. There is confusion in using this plugin since it also installs Alpha version in contrast to the plugin name of “Beta tester”. As discussed in the WordPress support forum thread this will be the future behavior of the plugin whenever the release track changes. Even if you download the file from WordPress.org site you will be end up in installing next Alpha version instead of previous beta version. Choose the “Bleeding edge nightlies” option and save your changes. Navigate to “Dashboard > Updates” and click on the “Update Now” button to install the latest development version of WordPress. If you find any bugs then report it in the support forum for Alpha / Beta version. Basically WordPress team monitors this forum and if there are no significant open topics pending then the test version will be updated to release candidate before being announced as a public version.